CHESWELL, Wentworth (1746-1817) was an American assessor, auditor, Justice of the Peace, teacher and Revolutionary War veteran in Newmarket, New Hampshire. He was of mixed race, one-quarter African and three-quarters European, and listed in the census as white. Elected as town constable in 1768, he was elected to other positions, serving in local government every year but one until his death. Cheswell is considered by George Mason University to be the first African American elected to public office in the history of the United States. Around the time of his marriage, Wentworth purchased a plot of land from his father Hopestill. His grandfather Richard is believed to be the first African American in New Hampshire to own land. 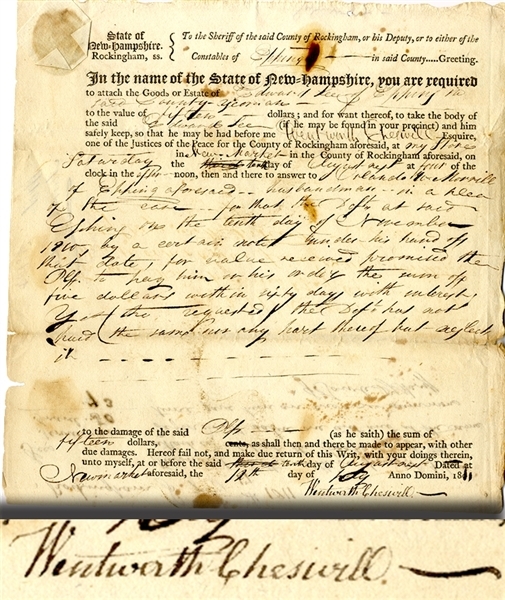 A deed shows that Richard purchased 20 acres from the Hilton grant in 1717. In 1801, Wentworth was among the founders of the first library in the town and provided in his will for public access to his personal library. Document Signed, “Wentworth Cheswill” as Justice of the Peace, on legal writ, Newmarket, New Hampshire, July 12, 1811, 1pp., 8” x 8,” VG. Cheswill orders the sheriff to bring Edward Lee before him at his New Market store to answer complaint for nonpayment of a $5 debt. The document is docketed by J. Towle as Deputy Sheriff, July 17, 1811 indicating the warrant was served.